Ever since we first launched Panda we’ve provided a jQuery plugin allowing developers to easily implement file upload functionality to their site or app. However, file upload through http isn’t particularly reliable: if your connection is slow or experiences even small disconnections during an upload you’d need to re-start the upload from the beginning. This can be very frustrating, especially when trying to upload videos that can be as big as 20GB! We have solved this problem by introducing a new upload API which provides resumable capabilities. As soon as your internet connection comes back online, your uploads will automatically resume from the point at which they were interrupted. I have just released yet another Open-Source project. This was gracefully sponsored by PandaStream, so I thought I might as well post here. Let me introduce you to socketmaster. In the tradition of UNIX, socketmaster does just one thing but does it well; it helps your app to restart without losing or refusing a single connection. socketmaster is the gatekeeper, keeping your sockets warm under the fire of restarts (christmas starts sooner every year isn’t it ? ho ho ho!). Change the startup code to open the file-descriptor 3 as a socket listener. At Panda, we have some truly great customers and are always interested to see how they’re integrating Panda with their apps and sites. 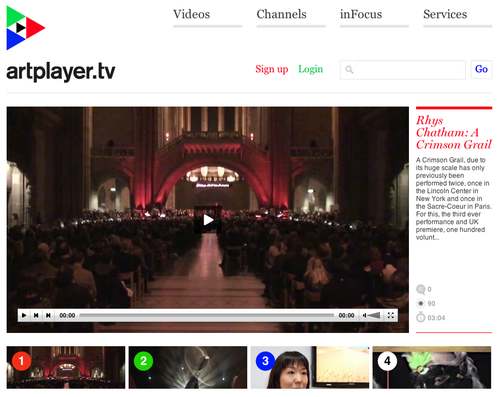 Artplayer is a unique online video platform aiming to showcase the best video content from the UK arts industry. In addition to a desktop and mobile web presence, Artplayer offers mobile apps, exclusive editorial content, access to major UK Arts organisations and a range of video services including production and training. We’re excited to officially announce that PandaStream has been acquired by MediaCore. Delivering the best online video experience has always been important to us and joining the amazing team at MediaCore will allow us to continue to pursue this goal with greater resources and a secure future. Friday we realeased a feature that we called Stacks. A stack is an encoding environment including a set of encoding tools and commands. This feature will provide us a way to upgrade ffmpeg without breaking your encoding commands. The current stack, called 'corepack-1' is still the one used by default. The new stack we are introducing is called 'corepack-2' and brings speed plus lots of new formats and codecs. using a Preset. They are easier to maintain and we provided lots of encoding options directly using either the web dashboard or the api. upgrading to the new stack. Your current encoding command might be incompatible with the new stack but it should be fairly easy to update it. Today we have deployed some very interesting improvements on our platform. Let’s review them all. Many of you have requested a way to store video inside folders instead of having everything in the root of your bucket. We think we found a nice solution to solve this problem. When you upload a video there is now a new optional attribute called path_format. It enables you to specify destination and name of a video and it’s encodings.